The Barn Owl is the most well known of our native owls, unfortunately the numbers are going down and at present there are only 3 to 5,000 pairs in the UK. There are many reasons for the low numbers, loss of nesting habitat i.e. barns which are now being turned into housing, lack of food, they are quite particular in what they eat and prefer short tailed voles , and also traffic because they fly so low they are often hit by cars etc. Open grass land is the preferred habitat of the Barn owl meadows, and pasture offer good feeding for them but they also hunt along hedgerows, banks and roadside verges. Hunting usually takes place just before sunset but when there are young in the nest the male can be seen hunting at any time. It is unusual but not unheard of for them to breed 500 feet above sea level. They will nest in buildings or holes, but now a days they are using boxes more as there are fewer natural nesting places. Boxes can be put up in most places, on a building, on a tree or on a wall preferably not to close to a busy road. There needs to be unobstructed access to the box and they need to be placed at least 3Metres above ground level. They should not be placed in a suntrap as the young can get overheated. The wind is not too much of a problem as the boxes are deep and protected inside you can place wood shavings for nesting material but this is not essential. 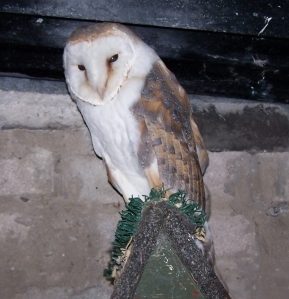 Barn Owls are legally protected and must not be disturbed.